Creatures living in the deepest parts of the ocean have been feeding on microplastic particles for at least four decades, a study by Oban scientists has revealed. Researchers at the Scottish Association for Marine Science (Sams) delved into the institute’s archived samples from the Rockall Trough, an area of deep sea off the west coast of Scotland. 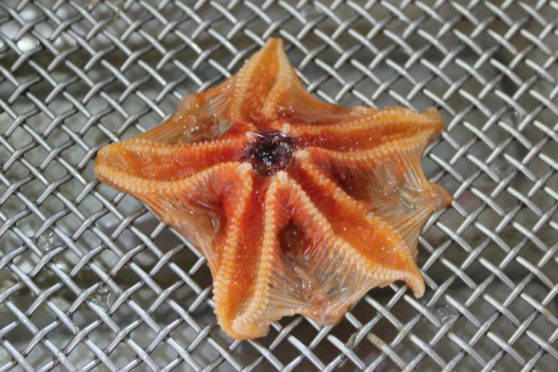 They used the samples to assess the extent of microplastic ingestion in the stomachs of bottom-dwelling starfish and brittle stars. Traces of eight different plastics, including polyester and nylon, were found in the stomachs of specimens that lived more than 6,560ft below the ocean surface between 1976 and 2015 – and the levels of ingestion were similar throughout that period. Across the time series, scientists found that nearly half of the starfish and brittle stars sampled had ingested microplastics, small pieces of plastic less than five millimetres in size. When ingested by sea creatures, microplastics may be retained in their bodies and passed up the food chain. The study, published in Environmental Pollution, follows on from SAMS research in 2017, which was the first to quantify the levels of microplastic ingestion in marine creatures living at depths of 7,217ft. Lead author Winnie Courtene-Jones, a University of the Highlands and Islands PhD student at Sams, said: “Mass production of plastics only began in the 1940s and 1950s, so it would be reasonable to expect less plastic in our earlier samples, with a subsequent upward trend to the present day levels, but we haven’t seen that. In fact, the level of microplastic ingestion is remarkably similar throughout the time series. “This data shows, for the first time, the long-term prevalence of microplastic pollution in the deep sea and indicated that microplastics may have been present on the sea floor of the Rockall Trough prior to 1976. Sams deep-sea ecologist Dr Bhavani Narayanaswamy, a co-author on the report, added: “To find such high levels of microplastic ingestion among deep sea creatures sampled more than 40 years ago shows that plastic pollution in our oceans is not a new problem.